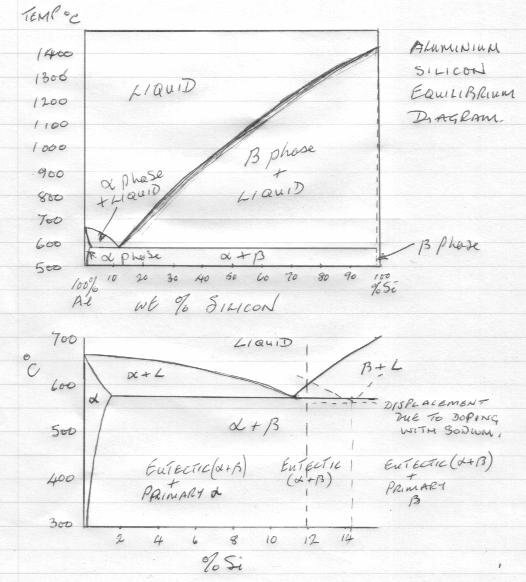 I come across a definition for metallographic analysis of Aluminum Silicon (plasma) spray coating, i.e. Eutectic Structure. Can you please help to find more details about this phase? I mean the formation, function and limitation of this phase within the coating structure, etc. Most aluminium silicon alloys tend to be around 12% Si which is roughly the eutectic composition for this alloy. Eutectic simply means "easily melted". Aluminium and silicon are completely soluble in one another in the liquid form, but on solidification have severely limited solubility and separate out as two phases, alpha (solid solution of Al + tiny amount of Si) and beta (solid solution of Si + tiny amount of Al). At the eutectic temperature ~ 577 C (melting point at eutectic composition) the eutectic forms on cooling at a single fixed temperature which is also the lowest temperature in the series. Note Al melting point 660 C and Si 1430 C are much higher. The eutectic formed is a mixture of alpha and beta phases (fixed composition whatever the overall composition of the alloy in which it exists) arranged in a lamellar or globular manner. Alloys with a composition lower than eutectic composition will result in primary alpha phase solidifying out at higher temperatures before eutectic point is reached. Structure will consist of primary alpha phase plus eutectic. Alloys above the eutectic composition will likewise consist of beta phase plus eutectic. not sure I've explained that very well. Basically, if you are referring to 12% Silicon aluminium alloy then this is roughly at the eutectic composition and the structure should predominantly be a eutectic with little or no primary alpha or beta phases. The silicon rich primary beta phase tends to make the alloy brittle so is normally avoided. Thanks for the detail explanation, it's really helpful for me. Now I understand the meaning of eutectic structure within the sprayed coatings. Will ask again if I get the test result later. 1. How to control the number of eutectic phase? 2. What influences the number of this phase on the tensile bond strength? 3. What parameters that can control the tensile bond strength of this Al-12Si powder?